Skipping ahead to 2017, I still think Julia is a badass, and that not much is better than spending a leisurely day in the kitchen with her recipes. 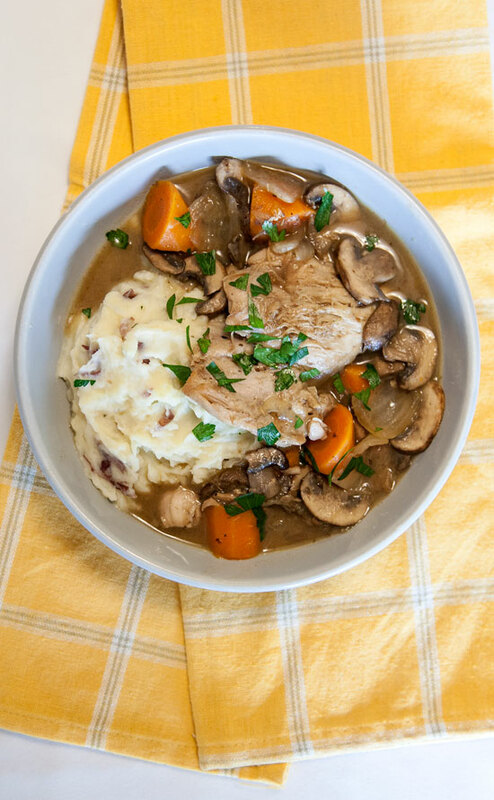 But when I want to streamline the operation, this is how I throw together a quickie, keep-it-simple coq au vin by taking advantage of Instant Pot. Bacon is optional, but traditional; if you have a slice on hand and you feel so inclined, you can start the recipe by crisping it up in the Pot on Saute Mode. Use the rendered fat (and/or olive oil) to saute a big pile of sliced mushrooms, then set them aside so they won’t overcook in the stew. Next, season and brown your chicken. In these photos I used boneless/skinless thighs, but I think bone-in pieces would be good here too (I haven’t tested it, but I would plan to increase the cooking time to 10 minutes). After browning the chicken, set it aside and start the onions. Pearl onions are my very favorite thing for this dish, but I’ve been having trouble finding them at my local stores, so I swapped in a regular old chopped yellow onion and lived to tell the tale. Deglaze with wine (red or white, whatever you like, go nuts) before throwing in (nearly) everything else on the ingredient list, then get out your steamer basket and load it up with the potatoes and garlic. I called for a generous amount of potatoes to serve 4, but abundance is nice, and leftovers are always welcome in my house. Both layers cook up in just 5 minutes on high pressure. The biggest secret behind this recipe may be the beurre manie. This “kneaded butter” is a simple flour/butter mixture that, when whisked into the cooked stew, transforms it into an enriched, subtly thickened, velvety sauce. 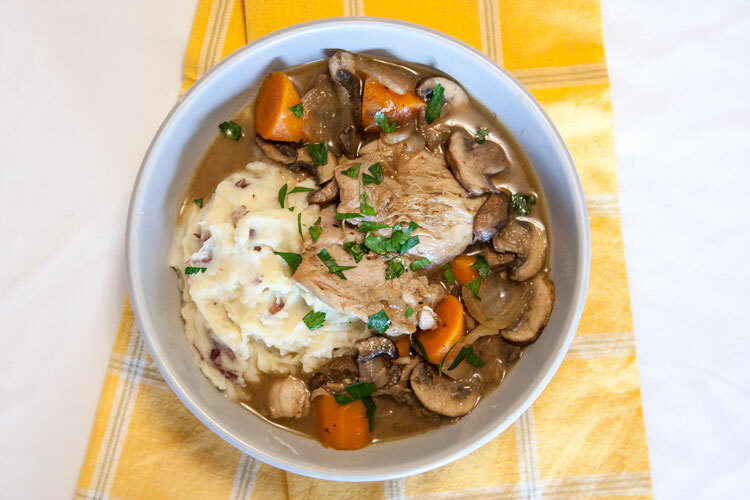 After making that magic happen, you just have to add the mushrooms back in, mash your garlicky potatoes, top with fresh parsley, and eat like a king. 2 large carrots, peeled and chopped in "rolling wedges"
If desired, start by cooking a slice of bacon: press the 'Saute' button to begin cooking at medium saute heat, and add the bacon once the cooker is hot. Cook until crispy, then set aside. If the bacon did not render about 1 tablespoon of fat (or if you choose not to use bacon), add olive oil to coat the pan before adding the mushrooms. Season with a bit of salt and pepper and saute the mushrooms, stirring occasionally, until soft. Set the mushrooms aside in a large bowl (this bowl can later be re-used to mash the potatoes). Add 1 more tablespoon of olive oil to the pot. Season the chicken pieces with salt and pepper, then add them to the cooker. Brown well on both sides, then set aside. After removing the chicken, add the onions to the cooker and saute until they begin to soften and turn translucent. Add the wine, scraping the browned bits from the bottom of the pot to deglaze, and continue cooking on Saute Mode until the wine is reduced by half. Add the broth, carrots, thyme, and salt, then add the browned chicken back into the stew (along with any juices that settled on the plate). Place a steamer basket on top of the chicken stew, and fill it with the quartered potatoes and garlic cloves. Cover the pressure cooker with the lid, ensuring that the valve is in sealing position. Cook under high pressure for 5 minutes (with Instant Pot, press ‘Cancel’ to stop saute mode before closing the lid, then press ‘Manual’ and "-" to select 5 minutes). 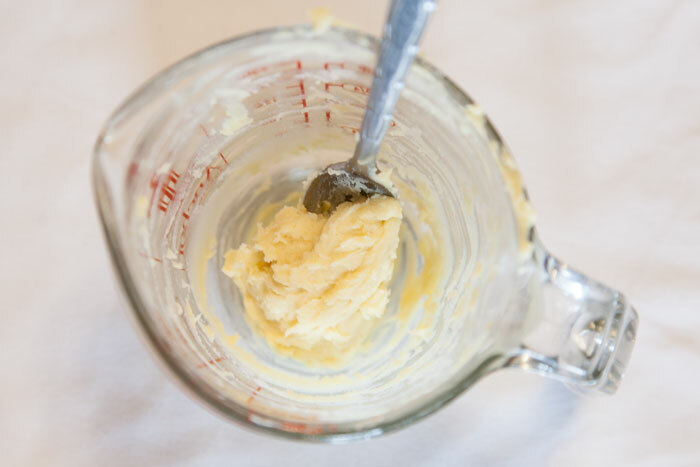 While the meal cooks, prepare the beurre manie: mix/mash the softened butter and flour together in a small bowl until they form a smooth paste. When the cooking time is up, allow at least 10 minutes for the pressure to release naturally. Open the lid and carefully set aside the steamer basket. Using a fork, gently whisk the beurre manie into the stew to thicken it, then stir in the mushrooms. Rinse the bowl, then dump in the potatoes and garlic. Add the butter, milk and salt. Season both the potatoes and stew to taste, and serve topped with fresh parsley (and the crisped bacon, if desired).